Nikon has also stated that they are developing non-S series lenses in the future. Whether these lenses represent some of the unnamed lenses in 2020 and 2021, or whether they are separate from this roadmap altogether, has yet to be confirmed. A source of frustration for Nikon DSLR users for years (and SLR users for decades) has been the lack of any autofocus lenses with an aperture wider than f/1.4, and any lenses at all wider than f/1.2. Although there has been some debate about the theoretical maximum aperture an F-mount lens could have, while still focusing automatically, the simple fact is that we’ve been using f/1.4 lenses and smaller for years. That looks like it is about to change. Nikon, not content with just doing one crazy thing like releasing an f/1.2 autofocus lens (which it is doing, starting with a 50mm f/1.2 in 2020), just announced that they’re planning to release a 58mm f/0.95 lens, the likes of which have never existed before for Nikon mount. This lens will not have autofocus, but the Nikon Z6 and Z7 both have focus peaking, and the 5-stop IBIS system with each camera will work fully with this new lens. The only comparable lens for Nikon or Canon at the moment is the Canon 50mm f/1.0 lens, which technically has autofocus, although it is famously slow. Nikon’s 58mm f/1.2 Noct lens is currently the fastest in the Nikon lineup (costing $3000+ used), and the company’s only other 58mm lens is the relatively new 58mm f/1.4. 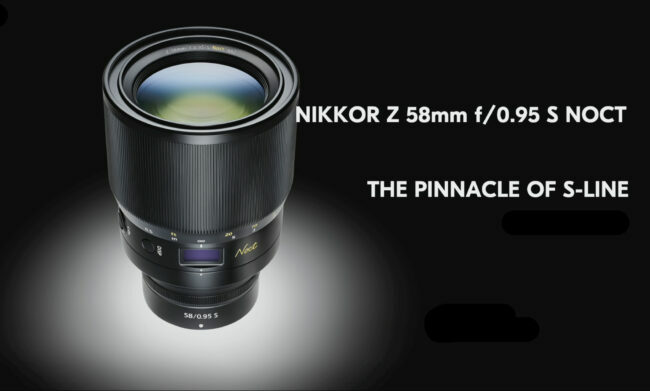 If this lens comes out with the image quality that Nikon is advertising – “the pinnacle of S-line” – it will immediately be a big hit for video users, many of whom will be willing to pay the doubtlessly high price for something as unique as a 58mm f/0.95 lens for a camera with 5-axis stabilization, 10-bit 4:2:2 output, and focus peaking (and RAW video coming in a future firmware update). A combo like that will be exceptional for video. And, of course, stills shooters will find it equally spectacular, with countless applications for portraiture, street photography, and close-up studio work. But expect an exhorbitant price. This list below keeps track of all the Nikon Z-mount lenses that have been announced so far, in the order that they shipped. Although it is a short list so far, we plan to update this article continually as new Z-mount lenses are released. $2400 for the Z6 and $4000 for the Z7, assuming those will indeed be the prices in the US. It will all be expensive but it’s very impressive. No half measures here, they’ve clearly been working on this for a long time and this might explain the overdue updates to D610 and D750. I know that the D3400 is an important camera to Nikon in terms of volume and revenue but the price is critical. It will be interesting to see how they address this very challenging market with an eventual new product. Yes, and near the beginning of the article there is mention of a 24-70mm f/1.8. Right. It should be f/2.8 as on the slide. Typical excellent copyediting. You’re quite right, just fixed it, thank you. Sorry for the typos, we have been publishing articles left and right today as new info came out. I wrote this one as Nikon’s mirrorless presentation was still going on! If you or anyone else notices others, just let me know. Thank you, Tomáš, just fixed it! Any conversion option to existing FX lenses? I know there are people disappointed with the lack of f/1.4 primes or longer-than-300 mm lenses, but I like the roadmap. Lots of new lenses coming to cover everything from 14 to 200. I’m impressed. Do you have any news in the coming years even if it takes 2 yrs. or 4 for a smaller, cheaper camera with a shorter or smaller lens for street photography that no one won’t notice you taking an image? Biggest hole in this lineup is a light telezoom or mid-range prime. Maybe the 70-200 will be lighter than normal due to new designs, but I’d like to see a 70-200 f4 or 135/2.8. I agree, it’s an odd omission. 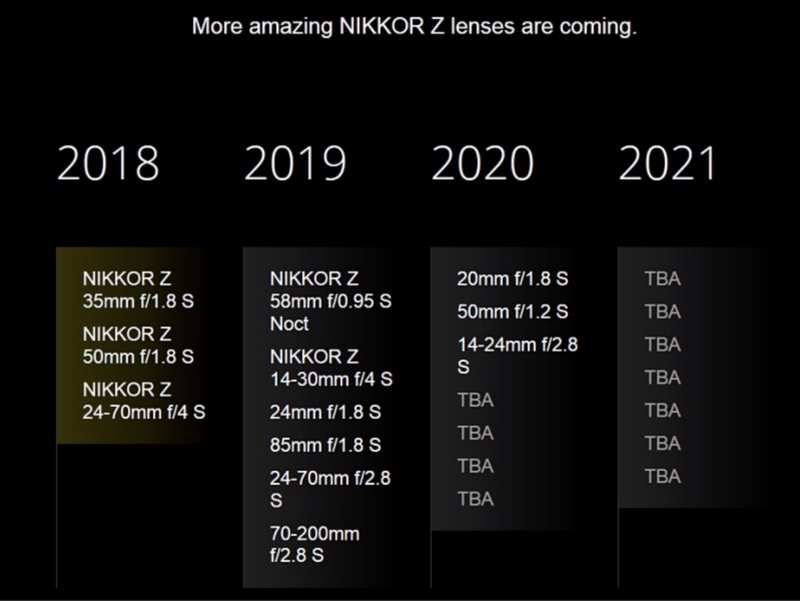 Still, it is worth keeping in mind that this is just the roadmap for the Nikon “S” series lenses. The product launch livestream implied that the S series was the higher-end lineup of lenses for their Z mirrorless cameras, so it is quite possible that we will see some lightweight telephotos that aren’t on this list. That might also apply to lightweight pancake lenses or similar, which also appear to be missing from this roadmap. Might be an opportunity to release a micro-Nikkor above 105mm, which hasn’t been done in a while. 150 2.8 would be awesome. Why no 24-70 f2 if going to the bother of a new bigger mount? (Canon to make a 28-70 f2) Also 70-200 f2? Will these apertures ever be available? Most pros use these lenses every day, not 58 f0.95’s, maybe they want them to buy slower zooms, then offer them super wide aperture ones later? I know there’s an adapter, so you can use your existing 2.8 zooms, that makes it an even better idea to make the Z zooms f2. My wish zoom: a 55-300 f4 or f4.5 as the one Nikon patented in 2012! Maybe it will come out at last with the Z mount! Alain, that would be great to see! There are a few blank items in 2020, so if we’re lucky, maybe we’ll see such a thing by then. The lack of an f/4 telephoto zoom is probably the most glaring hole in this roadmap, aside from perhaps some high-quality pancake f/2.8 or even f/4 primes.